The rise of surveillance technology, including face recognition software, drones, body scans and cell phones as GPS locators, has resulted in some creative attempts to elude it. 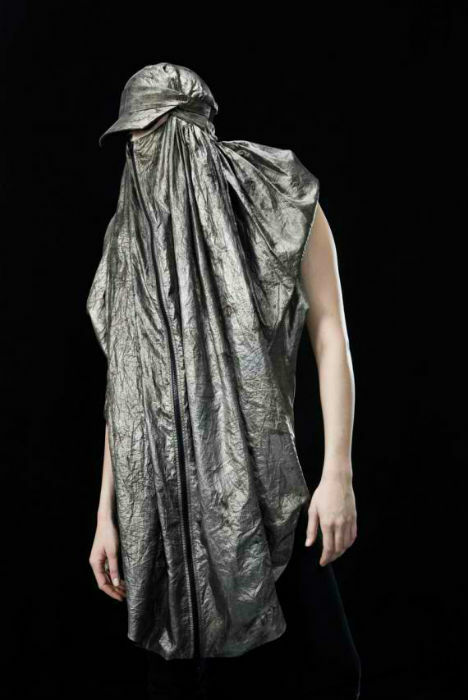 Designer Adam Harvey experiments with “fashion to challenge authoritarian surveillance” in a series called Stealth Wear (via PSFK). 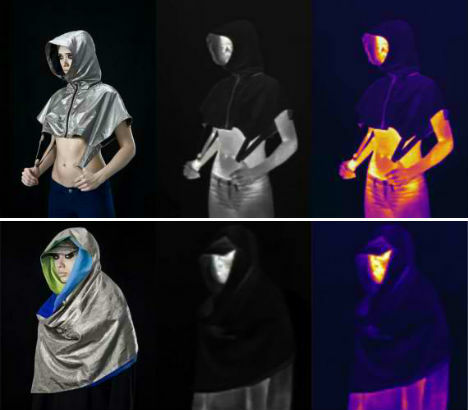 Anti-Drone garments protect against thermal imaging, a special cell phone pocket blocks signals, and off-the-wall makeup and hair styling techniques make it hard to ID faces. 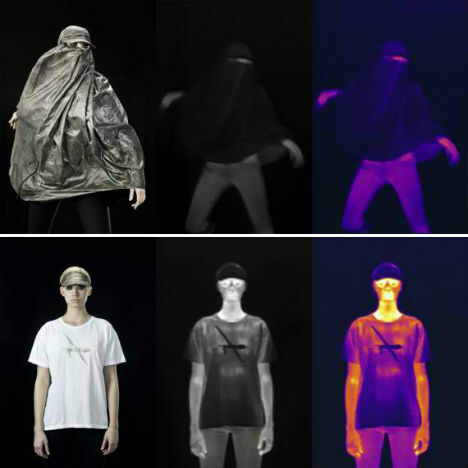 The Anti-Drone garments are made with a lightweight, breathable metallized fabric that reflects heat, masking the wearer’s thermal signature so they won’t show up in thermal imaging scans. Two of the designs are inspired by Muslim garments, including the burqa and scarf. “Conceptually, these garments align themselves with the rationale behind the traditional hijab and burqa: to act as ‘the veil which separates man or the world from God,’ replacing God with drone,” says Harvey. These garments aren’t intended to be serious gear for survivalists looking to elude The Man. They’re fashion, Harvey explains, exploring the ways in which we can interact and aestheticize our culture of rising surveillance. Technically, even the small parts that aren’t covered by the garments, like the hands and face, can give you away. 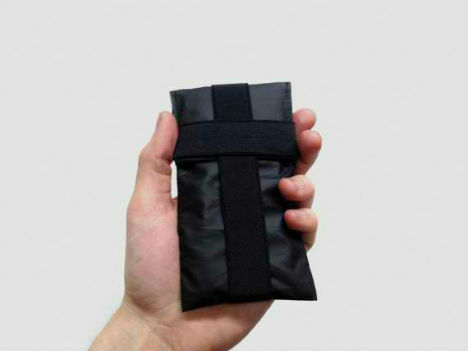 The OFF Pocket, however, is definitely usable: it’s a flexible waterproof cover fitting most sizes of phones, including Nexus and iPhones, that blocks all incoming and outgoing call signals. If you want to avoid facial recognition software determining your identity, you’ll have to get even more creative. Developed as his master’s thesis, Harvey’s project CV Dazzle attempted to find makeup and hair styles that would elude recognition. 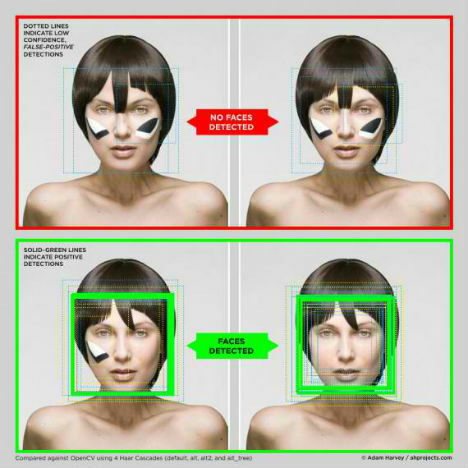 This collaboration between hair stylists, makeup artists and fashion designers used custom software that exposes the vulnerabilities of the OpenCV face detection algorithm, creating styles that exploit these weaknesses. 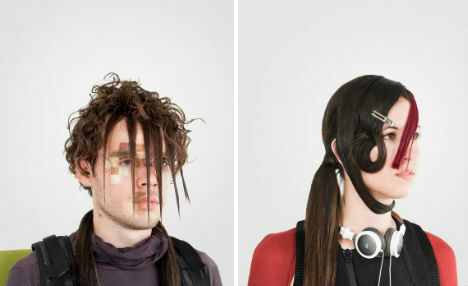 The looks are definitely a bit cyber-punk, but it’s interesting to see them gain a little practicality. Check out an article on ‘how to hide from machines’ that explores more of these techniques at DISmagazine.